As Christians, prayer is an indispensable part of our everyday lives, and the most direct way to draw close to God. We all hope that our prayers may be heard by the Lord, but we often do not receive God’s response or feel His presence, leaving us at a loss: Why is this? Why isn’t God listening to our prayers? What sorts of prayers are in line with God’s will? Let’s have fellowship on this today and by resolving these three issues, our prayers may be heard by God. 1. In Prayer, Do You Speak to God Openly, Confiding in Him Your True Thoughts? Much of the time, we pay attention to details such as the length of our prayers or our wording, or we even attempt to display our resolve to God through pleasant-sounding words, but we seldom truly open our hearts to God. For example, we commonly say: “God, I will love You, expend myself for You, and no matter how great the dangers or adversities I undergo, I will not give up. I will follow You for my entire lifetime!” Or, “God, Your words are the lamp before me, the light on my path, I will adhere to Your word in everything that I do, and meet Your will!” However, when met with adversities and setbacks, or difficulties crop up at home, we are often unable to put God’s word into practice and we lack the desire to fulfill His wishes. We even misunderstand God, complain about God, become demotivated, as well as betray and walk away from Him. That we behave this way in practical situations testifies to our lack of sincerity in our prayers to God, instead just talking big and spouting empty, nice-sounding words in an attempt to please God. It is also to have others think highly of us, to have God and others see that we love God and are faithful to Him, but in reality, our prayers are filled with hypocrisy and deceit. They are, in essence, an attempt to fool and deceive God. How can we expect God to listen to these sorts of prayers? Jesus once told this parable: “Two men went up into the temple to pray; the one a Pharisee, and the other a publican. The Pharisee stood and prayed thus with himself, God, I thank You, that I am not as other men are, extortionists, unjust, adulterers, or even as this publican. I fast twice in the week, I give tithes of all that I possess. And the publican, standing afar off, would not lift up so much as his eyes to heaven, but smote on his breast, saying, God be merciful to me a sinner. I tell you, this man went down to his house justified rather than the other: for every one that exalts himself shall be abased; and he that humbles himself shall be exalted” (Luke 18:10–14). It is not difficult to see that the Pharisee prayed in a hubristic manner, seemingly unaware of his own sins, parading himself under the premise of his ostensible good behavior. He was self-servingly bragging of his loyalty to God, saying nice-sounding things to God, exhibiting himself before God while belittling the publican (the tax collector). Such a hypocritical prayer could never be commended by God. The publican’s prayer was sincere, openly admitting his sins to God, acknowledging that he was a sinner, and expressing remorse. He also displayed a willingness to repent to God, and begged for God’s mercy. Seeing sincerity in it, Jesus commended the publican’s prayer. Jesus’ parable tells us that God detests the use of bragging, empty words, or words pleasing to the ear to ingratiate ourselves with God or to trick Him. God wishes for us to lay our hearts bare and speak our actual thoughts, speak the truth, communicating with God sincerely. The Lord Jesus said, “When the true worshippers shall worship the Father in spirit and in truth: for the Father seeks such to worship Him. God is a Spirit: and they that worship Him must worship Him in spirit and in truth” (John 4:23–24). And another passage of God’s words is: “The lowest standard that God requires of people is that they be able to open their hearts to Him. If man gives his true heart to God and says what is really within his heart to God, then God is willing to work in man; God does not want the twisted heart of man, but his pure and honest heart. If man does not truly speak his heart to God, then God does not touch man’s heart, or work within him. Thus, the most crucial thing about praying is to speak the words of your true heart to God, telling God of your flaws or rebellious disposition and completely opening yourself up to God. Only then will God be interested in your prayers; if not, then God will hide His face from you” (“Concerning the Practice of Prayer”). From this we can see that we must be open and sincere with God, tell Him our innermost thoughts and the truth, tell God of our true state and troubles, and seek God’s guidance. Only then will God hear our prayers. When we pray, we can tell God of the difficulties and suffering we face in our lives, and seek God’s will. Or we can come before God and open ourselves up to Him about our transgressions or whatever corruption we’ve revealed each day. This is having a sincere dialogue with God in all matters. Like when we often become infatuated with the world and yearn to follow the trends of society, becoming obsessed with worldly pleasures and we cannot bring our mind to peace before God, we can pray to God: “God! I find that I do not love the truth within my heart, but am always thinking of the dazzling world outside. Even when in a gathering, in prayer, or reading Your words, I cannot settle my mind. I want to forsake the flesh, but I find myself powerless to do so. God! May Your spirit move my numbed heart, providing me with faith and strength to prevail over Satan’s temptation and bring my heart to peace before You.” After several sincere prayers like this, the Holy Spirit will guide and lead us to see that following societal trends will cause us to live in sin and grow ever more distant from God. The Holy Spirit will also touch us, and provide us with a heart of love for the truth. We will then be able to forsake the flesh in practical ways, and overcome Satan’s temptation and seduction—this is the outcome we can achieve by speaking from the heart in prayer with God. However, if we do not open our heart to God in prayer, instead attempting to ingratiate ourselves with God and trick Him by using words that are pleasing to the ear, God will not hear our prayer and will not touch our hearts. We will be unable to discern or overcome Satan’s temptation and will inevitably follow evil trends, becoming further distanced from God and harmed by Satan. Therefore, if we wish for our prayers to be heard by God, we must be open and truthful before Him. This is the first step we must take. 2. Are You Praying to Practice the Lord’s Words and Achieve Life Growth? Once we’ve been corrupted by Satan, we are full of satanic corrupt dispositions; we are selfish, greedy, crooked, deceitful, and keep only our own interests in mind. In all things we put personal gain above all else and even in our faith we want more and more grace and blessings from God. Most brothers and sisters believe that since we believe in God, He should bless us and grace us, and no matter what we ask of Him He should provide it. We often supplicate and pray to God for fleshly benefits such as recovering from an illness, giving us peace at home, or allowing our children to find a good job. When we do enjoy His grace we very happily praise Him, but when He doesn’t respond to our prayers the way we would wish, we complain about Him. Have you ever given thought to whether constantly praying to God for our own fleshly interests is true communion with God, true worship of Him? The answer is no. These kinds of prayers are just an attempt to get blessings out of God; they are demanding things of Him and trying to get Him to act according to our own wills. It is not treating Him as God. These kinds of prayers can only arouse God’s ire, and He does not listen to them. As Christians, we shouldn’t just seek the blessings of the flesh or seek to have God bestow more grace and blessings upon us. That’s because these things just allow us to enjoy fleeting, worldly good fortune, but do not remotely help us grow in our lives. Neither can they help us achieve true obedience and fear of God. Our prayers and supplications should focus more around our understanding of the truth, putting God’s words into practice, and growing in our lives. Only this kind of prayer is in line with God’s will. The Lord Jesus said, “And seek not you what you shall eat, or what you shall drink, neither be you of doubtful mind. For all these things do the nations of the world seek after: and your Father knows that you have need of these things. But rather seek you the kingdom of God; and all these things shall be added to you” (Luke 12:29–31). “It is the spirit that vivifies; the flesh profits nothing: the words that I speak to you, they are spirit, and they are life” (John 6:63). God’s will is for us to practice and live out His words, and through His words gain both the truth and life so that we may achieve compatibility with God and ultimately be able to enter into His kingdom. Thus, our prayers should be centered around how to practice and experience His words; this way, He will lead us in undergoing His work, we will continue to understand more and more of the truth, and we will be able to live out the words of God. Think of how all of us frequently tell lies and do deceitful things in order to protect our own face, status, wealth, or interests. We are well aware that these are sins, but we can’t stop ourselves from sinning. Even if we don’t lie with our words, within our hearts we’re calculating what to say to protect our own name, benefit, and position, and what we should do so that our interests aren’t compromised. When we become aware that we have an urge to lie or do something dishonest we should come before God and pray, “Oh God! I’ve seen that I’m unable to achieve the simplicity and honesty of a child, but still can’t stop myself from lying or cheating. If I go on like this You will certainly loathe me. God! I truly need Your salvation—may You lead me to be an honest person, and if I lie or cheat again, may You discipline me.” After offering up prayers like this, when we once again have the desire to lie for the sake of our own interest, we will feel the Holy Spirit’s reproaches inside of us. We will clearly realize that God requires us to be honest people, and He takes joy in and blesses those who are honest. We cannot lie to uphold our own interests, as that is disgusting to God. Once we’ve realized all of this we’ll be able to forsake our crafty motives from the heart, seek truth from the facts, and call a spade a spade. By always practicing this way, before we know it we’ll be lying less and less, and we’ll be able to enter into the reality of the truth of being an honest person, one step at a time. This is the fruit of prayer for growth in life. The Lord Jesus said, “And I say to you, Ask, and it shall be given you; seek, and you shall find; knock, and it shall be opened to you. For every one that asks receives; and he that seeks finds; and to him that knocks it shall be opened” (Luke 11:9–10). Clearly, as long as we pray to God for understanding of the truth and the ability to put the Lord’s words into practice, and we treat entry into the truth with the utmost seriousness, God will guide us to understand the truth and enter into the reality of the truth, and we will be able to grow in our spiritual lives bit by bit. 3. Do You Pray to Seek Understanding of God’s Will and to Stand Witness for Him? Sometimes in our lives we encounter issues that aren’t in line with our notions, like problems at work or in the home, or we may even be faced with some sort of catastrophe. When these things occur, most of us ask God to take away these unpleasant environments and give us peace and happiness. Even if we work hard or even give up our relationships and our jobs to serve God, if we encounter something like a major illness we’re unable to calm ourselves and seek God’s will, and pray that we may stand witness and satisfy God. Instead, we pray to God, begging for Him to heal our sickness so that we can be free of the torment of illness as soon as possible. When God accedes to our request, we thank and praise Him, but when He does not make us well, we are disheartened and disappointed in God; we live within negativity, complaining about Him and we may even have the urge to toss our efforts for Him out the window. We can see from this that we are too enamored of our own fleshly interests; in our hearts we do not love or wish to satisfy God. We often make unreasonable requests in our prayers, making demands of Him in selfish and despicable ways to have Him do things according to what we want. We absolutely do not worship the Creator from the proper position of created beings. Why would God heed such prayers? Then how should we pray so we are in line with God’s will? His words direct us onto that path: “When you encounter difficulties, hurry up and pray to God: ‘O God! I wish to satisfy You, I wish to endure the final hardship to satisfy Your heart, and regardless of how great the setbacks I encounter, still I must satisfy You. Even if I have to give up my whole life, still I must satisfy You!’ With this resolve, when you pray thus you will be able to stand firm in your testimony” (“Only Loving God Is Truly Believing in God”). “You hurt inside, and your suffering has reached a certain point, yet you are still willing to come before God and pray, saying: ‘O God! I cannot leave You. Although there is darkness within me, I wish to satisfy You; You know my heart, and I would that You invest more of Your love within me’” (“Only by Experiencing Refinement Can Man Truly Love God”). When hardships come upon us, we must seek God’s will and pray that we can stand witness and satisfy God. We must also have the resolve to love and satisfy God, and be willing to endure physical suffering if it means standing witness for God rather than praying for our own interests. Only this kind of prayer is in line with God’s will, and this is also having the kind of conscience and reason we as created beings should possess. For example, Job lost all of his possessions and his children through his trials and he himself was afflicted with boils from head to toe; he suffered enormous emotional and physical pain. But he did not moan to God about why He had allowed him to suffer all of this, nor did he ask God to take his suffering away. Instead, he first submitted and prayed to seek God’s will. He recognized that all he owned had not been gained through his own toil, but had been bestowed by God; whether God gives or takes away, as created beings we should naturally submit to God’s rule and arrangements. We should not have any requirements of God, or any complaints. This is the reason we as humans should possess. Job said, “Naked came I out of my mother’s womb, and naked shall I return thither: Jehovah gave, and Jehovah has taken away; blessed be the name of Jehovah” (Job 1:21). Job ended up bearing a resounding witness for God by relying on his reverence, obedience, and faith for God. 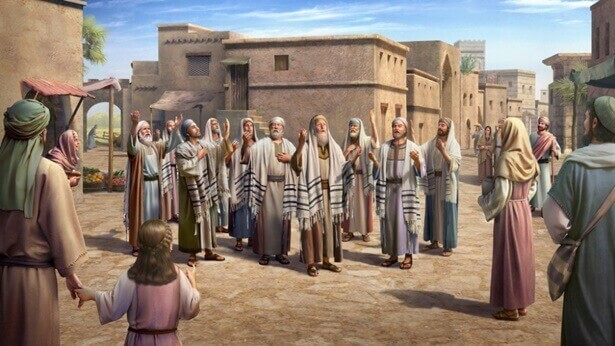 We should learn from Job’s example and when encountering something not in line with our notions, we must first quiet ourselves before God and rush to pray to seek God’s will, and pray that we may stand witness and satisfy God. This is the most critical aspect of our practice. This way, God can guide us; He can give us faith and strength to help us through any passes we may face, so that we may stand firm in our testimony through trials. These are the three issues we must resolve in our prayer. As long as we practice and enter in according to these principles in our daily lives, I am confident that all of us, brothers and sisters, will reap rewards we never dreamed of. Next：What Should I Do if My Work Is So Busy That I Shun the Lord?